Hyperactivation of the PI3K pathway is frequent in human cancer. Whether it occurs via overexpression/phosphorylation of upstream receptors that promote the binding and activation of PI3K, or as a consequence of activating alterations of the nodes of the signaling cascade, deregulated PI3K signaling can promote tumor growth and survival. This provided the rationale to develop inhibitors targeting virtually all the components of this pathway. Despite these efforts, however, the responses in the clinic have been anecdotal and short lived for most of these agents. In the last few years, clinical studies have demonstrated that specific compounds can elicit strong antitumor activity if administered to selected patients. For example, AKT catalytic inhibitors and specific PI3Kα inhibitors have shown promising clinical responses in patients with tumors bearing activating mutations of AKT and PIK3CA, respectively. 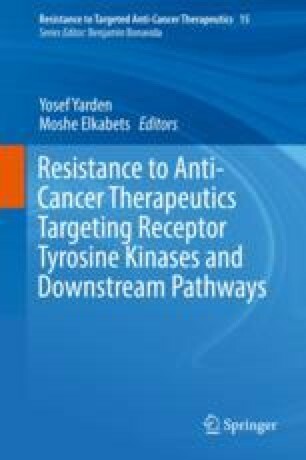 Nevertheless, the intrinsic or acquired resistance to PI3K/AKT/mTOR inhibitors limits the activity of these agents. The mechanisms that tumor cells adopt to by-pass pharmacological inhibition of PI3K/AKT/mTOR are tissue-dependent and can be the results of either pre-existing conditions that rapidly compensate for the therapeutic pressure or the acquisition of genomic and/or epigenomic changes that confer fitness over time even upon PI3K full blockade. In both cases, combinatorial strategies seem to be necessary to prevent or delay the emergence of drug resistance, and many of these therapeutic options are currently being tested in the clinic. We would like to thank the Breast Cancer Research Foundation and the Geoffrey Beene Cancer Research Center. Pau Castel is a Fellow of the Jane Coffin Childs Memorial Fund. We apologize for the impossibility to cite every author who has contributed to this field of inquiry. Juric D, Rodon J, Gonzalez-Angulo AM, Burris HA, Bendell J, Berlin JD, Middleton MR, Bootle D, Boehm M, Schmitt A, Rouyrre N, Quadt C, Baselga J. Abstract CT-01: BYL719, a next generation PI3K alpha specific inhibitor: preliminary safety, PK, and efficacy results from the first-in-human study. Cancer Res. 2012;72(8). https://doi.org/10.1158/1538-7445.AM2012-CT-01. Juric D, Krop I, Ramanathan RK, Xiao J, Sanabria S, Wilson TR, Choi Y, Parmar H, Hsu J, Baselga J, Von Hoff DD. Abstract LB-64: GDC-0032, a beta isoform-sparing PI3K inhibitor: results of a first-in-human phase Ia dose escalation study. Cancer Res. 2013;73(8). https://doi.org/10.1158/1538-7445.AM2013-LB-64. Banerji U. Results of two phase I multicenter trials of AZD5363, an inhibitor of AKT1, 2 and 3: Biomarker and early clinical evaluation in Western and Japanese patients with advanced solid tumors. AACR 104th Annual Meeting. Cancer Res. 2013;73(8 Suppl). https://doi.org/10.1158/1538-7445.AM2013-LB-66.